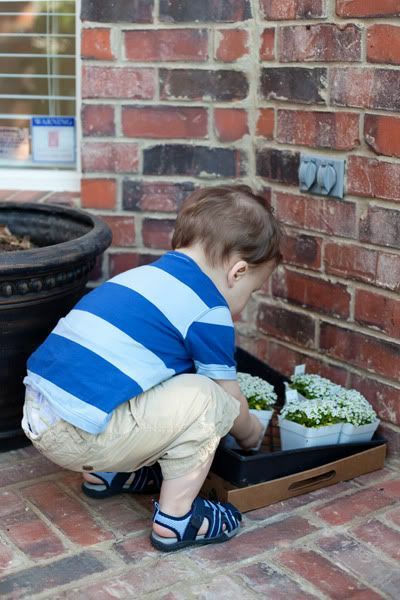 There's nothing like getting down to basics when you have your 22 month old help you plant flowers. Instructions you didn't think of suddenly pop out of your mouth: "No, honey...please don't pick off all the petals." or "Please don't throw dirt on mommy. Actually, please don't throw dirt at all right now. Thank you." But actually, I am continually impressed by how well Ethan can follow instructions. He was so interested in helping me and really seemed to concentrate on what he was doing. 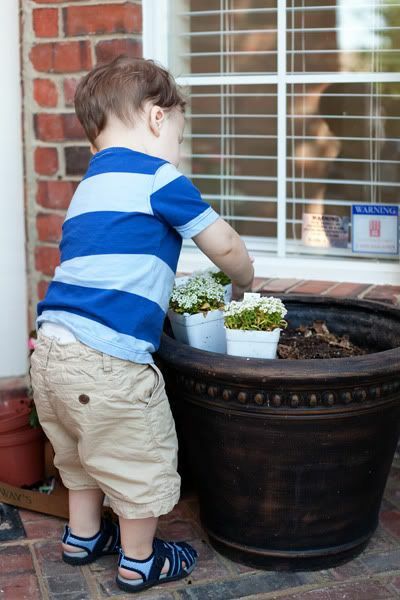 Here's the busy gardener-in-training. So busy that I couldn't get him to look at the camera. 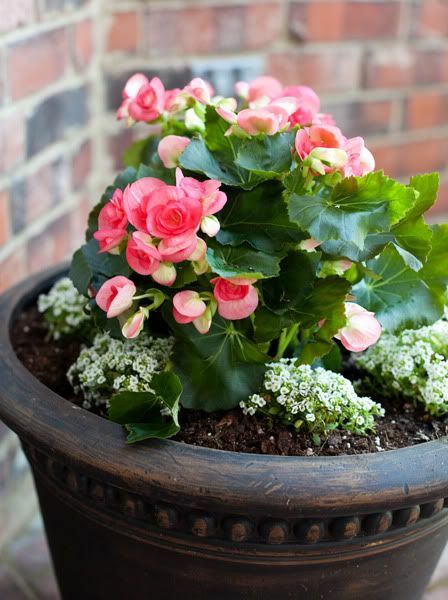 The beautiful pink flowers are actually a cultivar of begonias, believe it or not. I had never seen this particular cultivar before. It is called Rieger Begonia. The tiny white flowers are Alyssum. 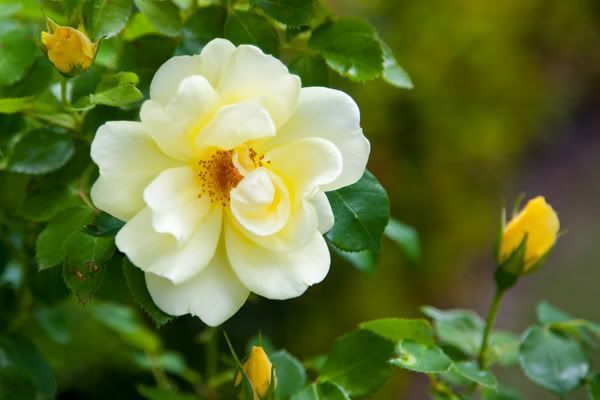 We don't have many flowers in our garden, just mostly evergreen shrubs and trees. And those take up all of our flowerbed space. And I don't have the energy to do anything about it right now. So besides our new potted flowers, here is the only other bloom in our front yard...a Yellow Knock Out Rose. 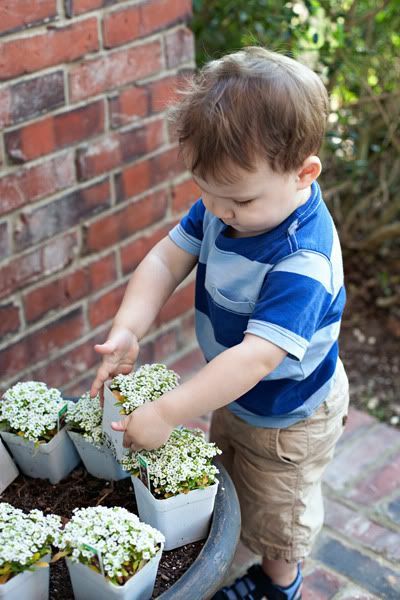 Nice blog with nice picture of cutie busy planting the flowers. He is blooming like a flower. LOVE the pink flower! I gotta get some planting done! Something tells me my children will not be as helpful! Your flowers are so nice. We don't have many flowers in our yard, either, but we do have some pink Knock Out Roses and they add a good splash of color to our otherwise green yard.